NEWPORT NEWS, Va., Dec. 23, 2010 — Department of Energy's Thomas Jefferson National Accelerator Facility has produced a long-sought, rare color of laser light 100 times brighter than that generated anywhere else. Steve Benson, Free-Electron Laser physics, manages UV lasing operations from the FEL control room during a run in September. The light was produced by Jefferson Lab's Free-Electron Laser facility. The laser delivered vacuum ultraviolet light in the form of 10 eV photons (a wavelength of 124 nm). This color of light is called vacuum ultraviolet because it is absorbed by molecules in the air, requiring its use in a vacuum. "We have succeeded in delivering 10 eV photons for the first time," said George Neil, Jefferson Lab associate director for the FEL Division. "Using a hole out-coupling mirror on the Jefferson Lab Ultraviolet Demonstration FEL, we delivered vacuum ultraviolet harmonic light to a calibrated VUV photodiode and measured five nanojoules of fully coherent light in each micropulse." The FEL ultraviolet beamline, with prominent red and green magnets, juts out to the right. 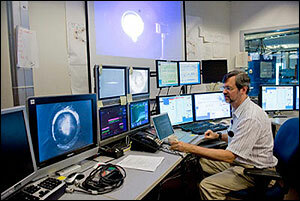 On the left, the infrared beamline also extends nearly the length of the room. The Free-Electron Laser program and individual research projects are supported by various organizations. These include the Department of Defense's Office of Naval Research, the Air Force Research Laboratory and the Joint Technology Office, the Commonwealth of Virginia and the Department of Energy's Basic Energy Sciences. 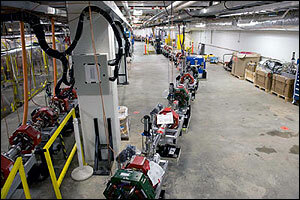 Key equipment was provided by the Wisconsin Synchrotron Radiation Center and Cornell University.